Cassibelaun, king of the Britons, to Caius Julius Caesar. We cannot but wonder, Caesar, at the avarice of the Roman people, since their insatiable thirst after money cannot let us alone whom the dangers of the ocean have placed in a manner out of the world; but they must have the presumption to covet our substance, which we have hitherto enjoyed in quiet. Neither is this indeed sufficient: we must also prefer subjection and slavery to them, before the enjoyment of our native liberty. Your demand therefore, Caesar, is scandalous, since the same vein of Nobility, flows from Aeneas, in Britons and Romans, and one and the same chain of consanguinity shines in both : which ought to be a band of firm union and friendship. That was what you should have demanded of us, and not slavery: we have learned to admit of the one, but never to bear the other. And so much have we been accustomed to liberty, that we are perfectly ignorant what it is to submit to slavery. And if even the gods themselves should attempt to deprive us of our liberty, we would to the utmost of our power resist them in defence of it. Know then, Caesar, that we are ready to fight for that and our kingdom if, as you threaten, you shall attempt to invade Britain. The reference in this letter to Aeneas provides support for the fact that the ancient British royal line stemmed from Troy, as did, traditionally, the descent of certain of the early rulers of Rome. And, as we have already seen, the tradition that the Trojan leaders were Judahites is upheld by testimony from many quarters. Cassibellaunus was not the only king of Britain who knew of his Trojan blood-line. Edward I, who removed the Stone of Destiny from Scone in Scotland to London, used to boast about his descent from the Trojans: The Irish and Scottish kings, Fergus and Edward himself were all descendants of Judah : in fact it is said that Edward used to boast of his descent from the Trojans (Co-Incidences? Pointers to Our Heritage, by Brigadier G. Wilson). William F. Skene, author of a book on the Stone of Destiny, states that the King of England, by whom the kingdom of Scotland was derived from Albanactus, the youngest son of Brutus, the Eponymus of the Britons, while that of England was derived from Locrinus, the eldest son. (The Coronation Stone. P. 21). Even James I knew of his background, and let it be known on several occasions that he was descended from Brutus! Geoffrey of Monmouth, writing in the first half of the twelfth century, sought to tell the story of Britain from it’s foundations by Brutus the Trojan until the coming of the Saxons Geoffrey claimed that his History of the Kings of Britain was translated from a very ancient book written in the British language which had been given to him by Walter, Archdeacon of Oxford. It was dedicated to two of the leading noblemen of the day, Robert, Earl of Gloucester (d. 1147) [a]son of King Henry I, and Waleran, Count of Mellent (d. 1166). In it he tells of the wanderings of Brutus, the great-grandson of Aeneas, forced to leave Italy after accidentally killing his father and eventually, after many adventures, coming to Albion, which he renamed Britain from his own name, after driving out the aboriginal giants. The story continues with the deeds of Brutus descendants and successors from about 1100 BC until the coming of the Romans Lewis Thorp’s introduction to his translation of Geoffrey’s History points out that it might be said to bear the same relationship to the story of the early British inhabitants of our own island as do the seventeen historical books in the Old Testament, from Genesis to Esther, to the early history of the Israelites in Palestine.Dorset Press, N.Y. 1992. P.8. In the manuscript section of the British Library lies an old document MS43968 that used to be kept in Windsor Castle. This particular chart gives the descent of the British Royal Family from Adam through Brutus. Also, charts published by the Covenant Publishing Co., Ltd., by W. M. H. Milner entitled The Royal House of Britain and by M. H. Gayer entitled The Heritage of the Anglo-Saxon Race both trace the ancestry of the Royal House through several lines of descent from the patriarch Judah including Brutus who is shown as a descendant of Judah’s son Zarah. In 51 AD, Caratacus son of Cunobelinus, the leader of Celtic resistance to the Romans in the South, was captured and brought before Cartimandua, who promptly turned him over to the Romans.8 Tacitus (3.45; Koch 1995:40) credited Cartimandua’s capture of Caratacus as having secured the most important component of Emperor Claudius’s triumph. CASSIVELLAUNUS (54.Bc) A British prince contemporary with Julius Caesar whose territory lay to the North and north east of the river Thames, comprising roughly of the modern counties of Hertfordshire, Buckinghamshire and Berkshire; its exact limits are uncertain. The people over whom he ruled were the Catuvellauni, a powerful and warlike nation who had encroached upon the surrounding tribes; their territory had been much extended before Caesar’s arrival in Britain by Cassivellaunus who had been engaged in constant conflicts with his neighbours, and his conquests had given him such supremacy over them that he was recognised as their natural and undisputed leader against the invader. Cassivellaunus is first mentioned by Caesar in his account of his second expedition to Britain in the summer of 54.B.C. landing and advancing some twelve miles into the interior of the country., he was recalled to the coast by the intelligence of the destruction of the greater part of his fleet in a storm. Ten days were consumed in repairing the ship that remained, and then, advancing to the Thames, Caesar found the enemy drawn up in great force on the northern bank of that river, under the command of Cassivellaunus. In spite of the British fortification of the banks , the Roman soldiers crossed the river, and the Britons were unable to stand before their attack, but the progress of the Romans was much impeded by the skilful use made by Cassivellaunus of his charioteers, four thousand of whom were employed in harassing Caesar’s line of march. In the meantime, the Trinovantes, another powerful people, occupying what is now Essex, and part of Middlesex, sent envoys to Caesar to announce their submission. Mandubratius, the son of their former king Imanuentius, had fled for refuge to Caesar, in order to escape the fate of his father, who had been killed by Cassivellaunus in the course of his conquests over his neighbours. The Trinovantes asked Caesar to send Mandubratius to rule over them and protect them from Cassivellaunus. Caesar granted their request and sent Mandubratius to them, at the same time demanding hostages and corn. The example of the Trinovantes was speedily followed by other tribes living along the course of the Thames. whose names are given by Caesar as Cenimagni, Segontaici, Ancalites, Bibroci, and Cassi. all of whom submitted. From them Caesar learnt that Cassivellaunus had not far distant, a fortified place in which a large number both of men and of cattle had been collected for protection against the enemy; this stronghold was promptly attacked by Caesar; its defenders were unable to repulse Caesar’s attack and made their escape on another side. Many of them were killed in their flight and the whole of the cattle fell into Caesar’s hands. The precise position of this place is unknown. Meanwhile Cassivellaunus sent instructions to the four kings who governed as many districts in Cantium, or Kent, to surprise and storm Caesar’s naval camp. The attempt failed, and, being discouraged by his own ill-success, and still more by the defection of his allies, Cassivellaunus submitted to Caesar, who took hostages, imposed an annual tribute, and enjoined Cassivellaunus to abstain from harassing the Trinovantes or their king Mandubratius. Caesar now left Britain, after a stay of barely two months. In Welsh tradition, as preserved in the Triads and the Bruts, Cassivellaunus appears as Caswallawn. Here much romantic detail overlies a narrative in which an agreement with the main outline of Caesar’s account can be traced. The name Cassivellaunus is Gaulish in form. The first part of the word is compared by professor Rhys with the name of the tribe of the Cassi, and the whole is interpreted by him to mean a ruler of the league or a tribe-king. Vellaunus probably means a ruler being connected with the Irish flaith (a prince), and with Welsh gwlad (country), English wield. 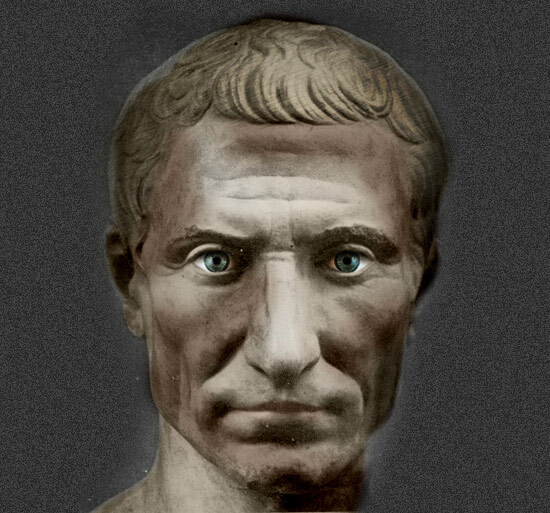 Julius Caesar was born in July 100 BC and named Gaius Julius Caesar. His name may have come from an ancestor being born by caesarean section. Caesar’s family claimed to be descended from the gods. The Julia clan believed they were offspring of Iulus, son of Aeneas Prince of Troy whose mother was supposed to be Venus herself. The name Caesar may have had many meanings, it could be that an ancestor had been born by caesarean section, but might have reflected a good head of hair, grey eyes or celebrated Caesar killing an elephant. Caesar’s own use of elephant imagery suggests he favoured the last interpretation. Aeneas was legendarily a forefather of Romulus and Remus. His journey from his native Troy to Italy is told in the Aeneid by Virgil, one of the great works of Roman literature. Caesar’s father (also Gaius Julius Caesar) became a powerful man. He was governor of the province of Asia and his sister was married to Gaius Marius, a giant of Roman politics. His mother’s family was even more important. Aurelia Cotta’s father, Lucius Aurelius Cotta, was Consul (the top job in the Roman Republic) like his father before him. Julius Caesar had two sisters, both called Julia. Julia Caesaris Major married Pinarius. Their grandson Lucius Pinarius was a successful soldier and provincial governor. Julia Caesaris Minor married Marcus Atius Balbus, giving birth to three daughters, one of whom, Atia Balba Caesonia was the mother of Octavian, who became Augustus, Rome’s first emperor. Caesar’s uncle by marriage, Gaius Marius, is one of the most important figures in Roman history. He was consul seven times and opened up the army to ordinary citizens, defeating invading Germanic tribes to earn the title, ‘Third Founder of Rome.’ When his father died suddenly in 85 BC. The 16-year-old Caesar was forced to go into hiding. Marius was involved in a bloody power struggle, which he lost. In order to stay away from the new ruler Sulla and his possible revenge, Caesar joined the army. Caesar’s family was to remain powerful for generations after his death. The Emperors Tiberius, Claudius, Nero and Caligula were all related to him. ← What is in your can of beer?